¶ Yes, it has indeed been a windy year. But Jamison isn't bothered any more. ¶ The evolution of elephants. ¶ Britain's Daily Telegraph's take on environmental hurdles to large-scale solar-energy projects in the American Southwest. I have been wondering about the value of such projects -- with the associated cost of transmission lines, etc. -- versus putting solar energy next to where it will be used, such as on the roofs of office buildings (all those acres of tar and gravel!). Organizers of the Democratic National Convention are finding it hard to have a "green convention," as measured by such important benchmarks as cotton fanny packs. Apparently, says the Wall Street Journal, you can have union-made fanny packs or you can have organic-cotton fanny packs (from China? ), but you can't have American-made organic-cotton union-made fanny packs. Yet Hizzoner John Hickenlooper has so decreed. Much of the hand-wringing can be blamed on Denver's Democratic mayor, John Hickenlooper, who challenged his party and his city to "make this the greenest convention in the history of the planet." Convention organizers hired the first-ever Director of Greening, longtime environmental activist Andrea Robinson. Her response to the mayor's challenge: "That terrifies me!" Watching the greening frenzy from afar, Fred L. Smith Jr., president of the libertarian Washington think tank Competitive Enterprise Institute, suggested the Democrats could really shrink their footprint by staging a virtual-reality convention: "Just have everyone stay at home with their laptops, sitting in their pajamas, interacting through their avatars." 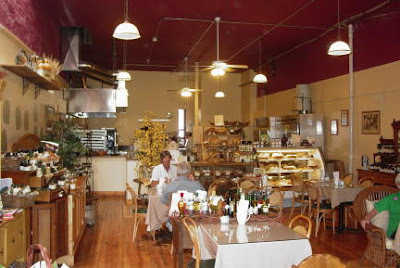 Florence is our nearest "supply town," but in the food department, its only offering has been one very ordinary supermarket, plus cafes and restaurants. Two things have happened to change that perception. The new Aspen Leaf Bakery has bread and pastries that don't arrive on a truck from Somewhere, plus sandwiches and coffee. 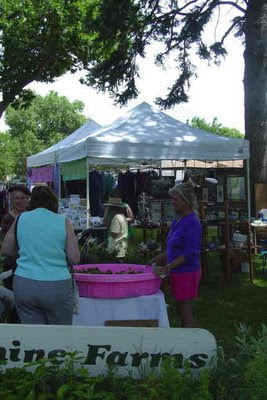 And today was the second appearance of the new weekly farmers' market, open from 7 a.m. to 1 p.m. on Thursdays in Pioneer Park, which included three vegetable sellers, plus local goat cheese and honey. That is not a huge number of sellers, but the market is new, and it's still early in the season. One thing about traveling by train, as opposed to car or airplane, is that you get a sort of "backstage" look at parts of the country. For instance, if you drive I-70 across Missouri, as I often have, you see what amounts to solid walls of billboards and chain restaurants and motels on both sides. Take the Southwest Chief from Kansas City up through La Plata, Mo., (the station for Kirksville and Truman State University) and into Iowa, and you see a different, less-glitzy Missouri. You see backyards and loading docks and small town streets, as well as the open country in between. Last week, riding through Virginia, West Virginia, Ohio, Indiana, and a corner of Illinois on the Cardinal, I saw a lot of backyards. It was depressing. You plant grass, fertilize it, mow it, look at it, mow it ... Some Midwestern yards are about a quarter-section in size, I swear. No, having a John Deere riding mower does not make you an agrarian producer. What surprised me on this late-June trip was how few vegetable gardens I saw, even in small towns and rural areas. 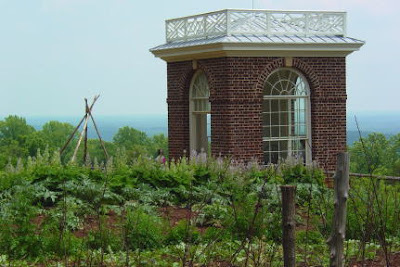 One thing Thomas Jefferson got right: at Monticello, the vegetable garden (photo above) is a whole lot bigger than the West Lawn, which was the grandkids' playground. In line with Michael Pollan's admonition to "Eat food," if some fraction of the vast American lawn were given to gardening, think of the positive effects. I don't mean just the lower carbon footprint of walking out to the garden to cut some lettuce. I think everyone should grow some little part of what they eat, just to stay in touch with reality -- the reality of air, water, sunshine, and soil. There might be other social and personal benefits as well, but this post is already long enough. "Something just came down, pecked me in the head, took my hair and started flying away," she said. "It's so bizarre. It's this little bird." I noticed this story mainly because it reminded me of an exchange overheard as M. and I walked through Grant Park in downtown Chicago last Thursday. Young Urban Woman #1: "What are those black things?" Young Urban Woman #2: "Birds." Almost every state produces wine these days, and Virginia is no exception. After my recent visit, I think that every newspaper feature writer seizes the same rhetorical flourish when writing about wineries: This is the wine that Thomas Jefferson would have wanted to make. But the native American grapes made poor wine, while the French vines had to suffer transportation by sailing ship and wagon to a site that apparently did not suit them, in a hotter, more humid climate. Although he aspired to make Monticello-grown wine, his continual replanting of the vineyard suggests a perennial and losing struggle with grape cultivation . . . . Although Jefferson probably never made a Monticello wine, the diverse collection of varieties he assembled and his influential advocacy of American viticulture were worthy accomplishments in themselves. Which is putting a nice spin on it. He inspired people who know more about viticulture and oenology than he could have known to try planting vineyards, and today they can make good wines. And they name wineries after him. The grapes in the photo are growing at Monticello today. I wonder if Jefferson would have seen a political metaphor in the Great French Wine Blight, when those same American root stocks saved the French industry. Peaches did better on his ridge top (brandy! ), as did cherries and some apples. Plums and most berries found the site too hot. I walked in the orchards and tried some of the cherries, which burdened the trees and were not being picked. Although most orchards were fenced in the 19th century, it was customary for travellers through the Virginia countryside to help themselves to bearing fruit. Wayside orchards were considered part of the common domain. The entrance hall of Monticello (this photo exaggerates its size, I think) was Jefferson's museum for visitors. Many items on display came from the Lewis & Clark expedition: There were clothing, weapons, and other artifacts from the tribes of the Northern Plains and Rocky Mountains. (These are long gone, but have been re-created by Indian artisans of today.) On the natural history side of the room are antlers, fossils, and so on. Many Americans have heard that Jefferson instructed Lewis and Clark to be on the lookout for actual live mastodons and woolly mammoths. Failing that, they were to bring back fossils. And here is a wonderful web site about that aspect of their expedition: Lewis & Clark's Lost World: Paleontology and the Expedition. On my recent trip to Virginia, I finally visited Monticello, the ridge-top trophy home of Thomas Jefferson, a man whose fingerprints are all over American culture to this day. Now there are some accomplishments "with legs." But with all due respect, Citizen Jefferson, did you have to be so hard on cities as cancers on human society? And then--the Jeffersonian part--having occupied such parcels, the owners immediately put on like a suit of clothes all the virtues that Jefferson ascribed to the rural yeomanry, even though they themselves almost never engage in agricultural pursuits for money. Yes, I live on a small mountain acreage, so I must have caught the Jeffersonian virus. In fact, M. and I experiment with plants and take notes on our failures and successes, so we definitely have it. But she has lived in Manhattan and I in other cities, and we both admit that living in a vibrant city (as opposed to a suburb full of strip malls) can be exciting. We just decided not to do it anymore. We think that if cities were designed for people rather than for cars, more people might want to live in them, and there would be less pressure for creating rural subdivisions outside them. It's a pity that Citizen Jefferson did not turn his architectural talents, which were genuine, to urban design as well as to designing country residences and buildings at the University of Virginia. During our stay in Charlottesville, an acquaintance there--an environmental activist/blogger who works on land-use issues--said that every time someone tries to write zoning regs to restrict ridge-top trophy homes, the would-be builder will complain, "If they'd had this law back in the 18th century, Jefferson couldn't have built Monticello." And there is some truth to that. Of course, he owned most of what he could see from the front steps, if that is grounds for an exemption. Amtrak can move a passenger a mile with 17.4 percent less fuel than a passenger car can, and about 32.9 percent less than an airline can, according to the Oak Ridge National Laboratory. As a resident of rural Colorado, I do depend on Amtrak for some cross-country travel. (I just rode it back from Virginia.) The cross-country trains are heavily used, but some politicians don't like them. Don't ask me why--we subsidize cross-country air travel heavily, not to mention interstate highways. ...dropping states from [Amtrak's] itinerary would hurt its political support, especially in the Senate, where thinly populated states are overrepresented relative to their population. And if you live in southeastern Colorado, for instance, Amtrak is actually fairly convenient -- as long as you want to go in the direction of Los Angeles, Kansas City, or Chicago! In Colorado, the Salazar brothers at least have good pro-Amtrak voting records. ¶ ZipcodeZoo is a site that tries to localize information about wildlife. It has special features for teachers, lets you build "life lists" of animals, offers quizzes, and so on. A lot of the information on my "personalized home page" is general Colorado information, not Wet Mountains information, but I still like the concept. ¶ Doesn't "fantasy fishing" destroy the whole point of going fishing? ¶ Another local-content wildlife web site is eBird, from the Cornell ornithology lab. Fishers on the Move in New England--Why Not Colorado? Two years ago I blogged about M.'s possible sighting of a fisher near our home. Some of our wildlife-minded friends said it was possible, while others said there were no fishers here and that she must have seen a big pine marten. But apparently fishers do get around. Today's New York Times describes them expanding their territory in the Northeast. At the same time, the fisher’s ability to adapt quickly to non-native habitats astounds biologists, who see it as a conservation success. Population statistics are hard to come by, because the animal is difficult to spot and large-scale studies have not been done. But biologists say that counts of road kill as well as the fisher’s presence in new territories clearly indicate its expanding numbers. OK, that's New England. But if it can expand its territory in one part of the country, why not another? 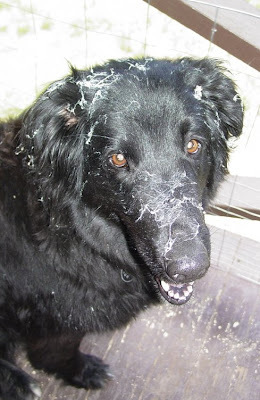 ... dog blogging about car trips. Example the first. And the second. I love wild iris, but it's too dry here in the foothills for them to grow on their own. They do better in the higher, wetter mountains. But some years ago a colleague gave me a gunny sack full of domestic iris rhizomes she had left over after re-digging her flower beds. 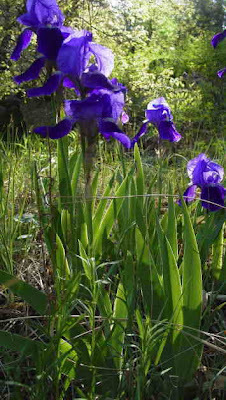 Our "landscaping" here consists mostly of holding the trees at bay ("defensible space") plus a vegetable garden, so I turned the iris loose in the woods. I planted them here and there in little gullies and other low spots that I thought might stay damp in a dry year. And they have held on. In some bad years, they do not bloom at all. This year we are getting a moderate bloom. It's enough. And while sometimes I am a native-plants purist, I don't think these iris are going to colonize Colorado very fast. And we all know that there are noxious weeds and "noxious weeds." Take bindweed, for instance. As a gardener, I hate it. But my rancher friend says that cattle will eat bindweed in a dry year, so it gets a tacit exemption from all the weed-control programs--around here, at least. Did May seem chilly to you? Apparently that was common. Researchers studying birds had already found that heightening male birds' colors makes them more attractive to females. The article reminded me of a passage from one of Gary Snyder's essays in The Practice of the Wild. Florence Edenshaw, a contemporary Haida elder who has lived a long life of work and family, was asked by the young woman anthropologist who interviewed her and was impressed by her coherence, presence, and dignity, "What can I do for self-respect?" Mrs. Edenshaw said, "Dress up and stay home." The "home," of course, is as large as you make it. One of my favorite movies is The Cuckoo, a wartime drama (but not a "war story") set in a remote corner of Finland and directed by a Russian, Aleksandr Rogozhkin. Netflix finally delivered one of his earlier works, Peculiarities of the National Fishing (title literally translated from Russian). Think of Caddyshack mixed with Cheech and Chong, with vodka playing the role that marijuana plays in the latter. There is a Peculiarities of the National Hunting too, but I have not yet located it. The latest in antipodean environmental education. No doubt the "calculator" works because the intended audience is (a) too young to drive (b) pays no utility bills and (c) gets a free ride on their should-be-dead parents' carbon footprint. And yet it says nothing about vodka consumption. Another article on Indian tribes buying their traditional lands for cash. In terms of total acres, the Navajos are probably ahead, having purchased more than 2.5 million acres. Terry Lynn "Oops, now what do I do?" Barton is out of prison. She does not yet have a job. Please don't let the Forest Service take her back.